Diving in icy water may not seem appealing, but there are a lot of reasons to try it. Underneath the ice, the water is actually warmer than the air temperature, although it’s still very cold. The water clarity in freezing water is remarkable. Because it’s so cold, no plankton remains active, and it sinks away to the depths. This means that there is nothing to cloud the water. Underneath the ice, a ghostly light makes its way through the solid icy roof. Ice divers must be protected from the cold. It is recommended that you wear a drysuit combined with the most efficient undersuit available. This can be used with an extra base layer, dry gloves and a thick warm hood. It’s possible to purchase an electrically heated vest, which is made from a hi-tech material and is powered by a large lithium-iron cell that is simply switched on and off. The ice that divers are most likely to dive under is that covering a frozen lake. Beforehand, it will be necessary to cut an access hole in the ice with a suitable saw. 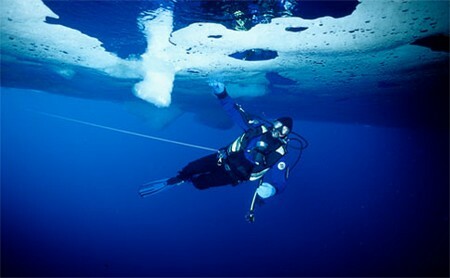 Dropping down into the warmer water under the ice, a diver will immediately be aware that the only exit is the way in. Losing the exit hole could have dramatic consequences, so the diver must be securely roped. The rope is paid out by someone acting as a tender outside the entrance. Frozen regulators are a serious risk, and for that reason, the diver should always be equipped with a second and totally independent air supply. There are regulators available today that are especially designed for use in extremely cold fresh water. Their first-stages are environmentally dry-sealed to keep the mechanism inside dry, and they are also equipped with good heat exchangers that can draw what little heat there is in the water to warm up the very cold air coming from the tank. The second-stages are made of metal, or have large areas of metal incorporated in their construction, for the same reason. Some even have finned heat exchangers, in the form of finned metal sections, in the intermediate pressure hose between the two stages. The scrubber unit that removes the poisonous carbon dioxide in closed-circuit rebreathers produces heat as a byproduct of the chemical reaction. This warms up the gas in the breathing loop, so many ice divers now use rebreathers. There are special ice-diving courses available that teach planning, organisation, techniques and how to avoid or solve potential problems. Selecting a site, preparing for the dive, special equipment and diver safety procedures are also covered. Ice-diving trips to the Arctic and Antarctic are now available. You should always stay within the zone of daylight while diving under ice.